The ApplyCrv command wraps curves and points that are within tolerance of the World XY plane onto a surface. The ApplyCrv command is usually used with the CreateUVCrv command. 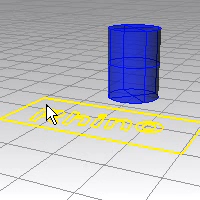 You can use the CreateUVCrv command to generate a UV rectangle from a 3-D surface. The UV rectangle represents the flat U and V dimensions of the 3-D surface. Draw some curves inside the UV rectangle. 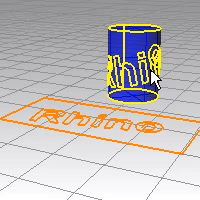 Use the ApplyCrv command to map the curves with the UV rectangle onto the 3-D surface. Tip: If the UV rectangle is not selected together, the curves will be mapped onto the whole range of the 3-D surface. The result will not be correct. Select curves and the UV rectangle on the world xy plane. 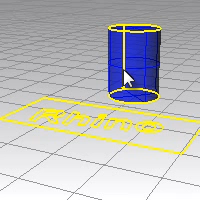 3-D curves are created on the surface using the UV rectangle as mapping reference.